With a 160 degree bore sight, this slewable curtain antenna can literally adjust its angle to target any portion of Latin America, South America and Cuba. The slewable antenna has no moving parts other than the slew switches; rather, it uses phase-shifting to steer the beam. For those of you, like me, who got their start in ham radio by listening to international broadcasters on the shortwaves, you might like the article I just posted on the SWLing Post. 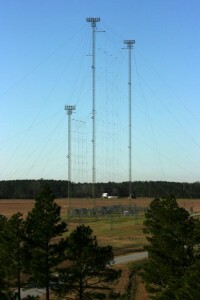 It’s a tour of the Edward R. Murrow Transmitting Station in Greenville, North Carolina. Formerly known as VOA Site B, this IBB transmitting station has a global reach and a dedicated team keeping her running each and every day. The article was published earlier this year in The Monitoring Times magazine. Since there was no worries with page space, I was able to include even more hi-res color photos in my blog post. Click here to read the full article on the SWLing Post. This entry was posted in Articles and tagged IBB, Shortwave Radio, VOA, Voice of America. Bookmark the permalink.